Macau’s casinos were allowed to resume operations today (Monday) at 8am, the government said, after Typhoon Mangkhut – a category 10 storm – struck the city over the weekend. Casino operations were paused at 11pm on Saturday, according to a government release that day. It was understood to be the first time in the modern era of public gaming concessions that the city’s casinos had been told by the local authorities to close for a time. The government said the city-wide suspension of gaming operations was for the safety of casino employees, visitors, and the city’s residents. 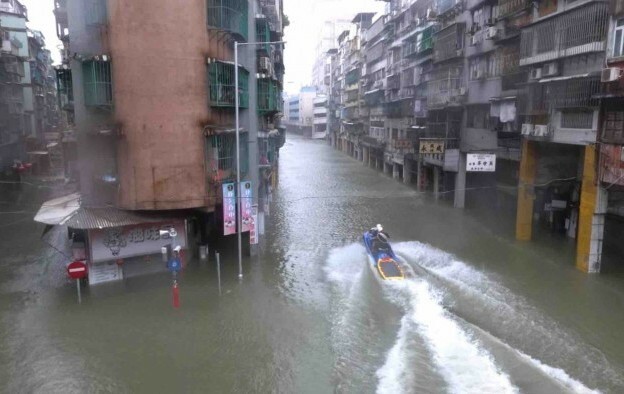 Typhoon Mangkhut was one of the fiercest recorded storms ever to hit Macau. It passed over the city with wind speeds of about 160 kilometres per hour (99.4 mph), causing serious flooding in the city and widespread damage to infrastructure. Floodwater levels reached up to 1.9 metres (6.2 feet) above road level on Sunday in some of the city’s districts. The typhoon category was lowered to Signal No. 3 today at 4am. Last year during the category 10 Typhoon Hato, the Macau casino industry’s pause was by default – on a venue-by-venue basis – across the local industry, depending on the level of damage each venue experienced, and its respective access to off-grid sources of power and water. During Typhoon Mangkhut, the city’s border crossings to and from mainland China were closed at 1am on Sunday. Ferry services to and from Macau had been suspended at 10pm on Saturday. The government’s decision to pull the plug on the city’s casino operations would likely impact this month’s casino gross gaming revenue (GGR), according to investment analysts covering the Macau gaming industry. Brokerage Union Gaming Securities Asia Ltd said in a note on Sunday evening that the exceptional closure of all Macau casinos – which “happened on an all-important weekend day” – probably shaved at least 500 basis points off the annual growth rate of September’s casino GGR. Union Gaming said it was lowering its September GGR growth forecast to somewhere in the range of 7.7 percent to 9.3 percent, from 14.7 percent previously. Deutsche Bank Securities Inc shaved 11 percentage points off its September GGR growth estimate in a Sunday note, bringing it down to 3 percent year-on-year from 14 percent.